Dunkirk Maryland Truckmount Steamway Mastermatic 4000 Truckmount, Castex Portable, U.S. Products Upholstery Machine, RX 20, Turbo Tools, Powerflite Floor machines, NSS Burnisher, Dyson Vacuum, Pro Chem Spot Pro, Pro Chem Titanium Wand, multiple fans and air movers, Bridgeport and CTI Products. What makes your vehicle stand out from the competition? Besides being a rolling billboard for our business and the services we provide, we are able to provide a multitude of services when we arrive at a job location. With our vehicle presence we try to establish a higher standard in the industry in the services we provide. We are professionals. *The above article was taken from ICS Cleaning Specialist magazine. 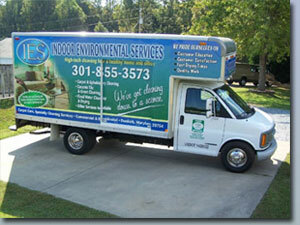 Indoor Environmental Services was selected as the Service Vehicle of the month for May 2006.